The Knox SDK provides information on how to use APIs to control Knox-enabled devices running in Samsung DeX. Samsung DeX is a new user experience that extends the functionality of your Android device to a desktop environment. Simply connect a compatible device to an HDMI monitor with the Samsung DeX Station or DeX pad, and it automatically launches. Here is an illustration of this process when launched. Note, you must be using Knox 3.1 or greater to access the Samsung DeX APIs. Knox 3.0 and below do not have the Samsung DeX APIs built into the framework. See the Samsung DeX overview for a full list of the APIs. 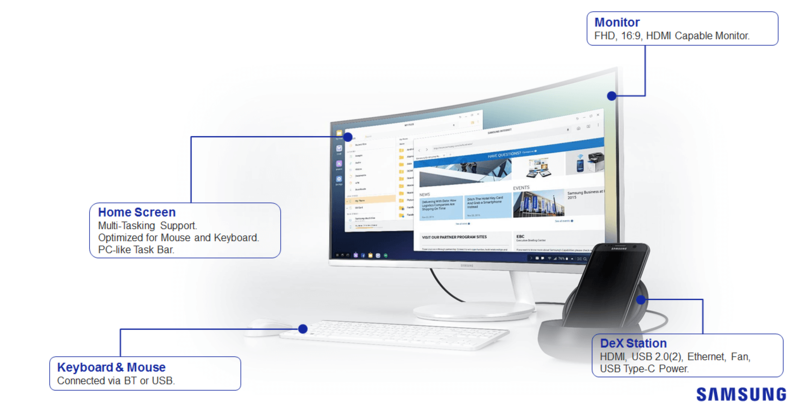 The Knox 3.3 SDK provides 4 new features to the Samsung DeX device: auto start, on-screen keyboard, open app on DeX display, and set custom wallpaper. If this API is set to FALSE, Screen Mirroring is the default start up mode; or TRUE and Dual Mode is enabled by default. To use DeX mode, the user can swipe down from the notification panel to turn their device into a keyboard or mouse. Show the on-screen keyboard on a device or tablet, even when the physical keyboard is being used in DeX dual mode. Provide the menu option for users to automatically open the last app they were using when starting or exiting Samsung DeX. This will help the user to continue using an app when docking and undocking a device. Result In this case, this method supersedes setForegroundModePackageList and the apps’ behavior is dependent on how the user toggles this allowed setting feature. In the settings, this feature will appear greyed out, and the device user will be blocked from enabling it. To enable this feature, set the apps using the setForegroundModePackageList API. Note: This API has a dependency on the setForegroundModePackageList API. For more information on foreground vs background apps on Samsung DeX, see the Samsung DeX developer guide. Set wallpaper for Samsung DeX while in dual mode. This API supports the any format supported by the BitmapRegionDecoder. setHomeAlignment: This API allows IT Admins to modify the way apps are aligned in DeX mode. For example, you can align apps in a preferred order. This functionality is perfect for organizations that want to set up numerous identical workstations throughout their organization. addURLShortcut – This API allows IT Admins to add a browser shortcut with a specific URL on the DeX home screen. This functionality is useful for enterprises that require users to access a URL frequently – for example, an internal Intranet network. A customized icon can also be displayed. Adopting Samsung DeX and controlling it with the Knox SDK allows you to capture a larger target audience. For example, you can add in features that further secure a banking app, such as controlling the screen timeout and enforcing a secure Ethernet data connection when the employee is plugged into the dock at work. You can enable or disable Samsung DeX with a single API: setDexDisabled. Call setDeXDisabled to trueor false. NOTE – this API requires the permission com.samsung.android.knox.permission.KNOX_DEX. Call allowScreenTimeoutChangeand set screen out time to true or false. Load in the custom boot image. This must be a png. Call setLoadingLogo with the file path. NOTE – this API requires the permission com.samsung.android.knox.permission.KNOX_CUSTOM_DEX. Call addShortcut Pass in the x and y position of the shortcut and the component. Call enforceEthernetOnly and set to true or false. Call addShortcut and pass in the required parameters. component	 The specific component to launch the URL shortcut. For complete information on methods, classes, and implementation, see Samsung Knox SDK API references.